Do you ever feel envious of those lucky, lucky recipients of the carefully knitted gifts that you give them? Do you secretly wish that you could have something soft and woolly and handmade to open? Well, here’s your chance. S&B London is already working hard to plan the most knitastic Christmas party London has ever witnessed. Secret Santa has metamorphasised into the most party-hearty part of it all. Last year there were squeals of stitching glee, snickers of ‘I got the best pressie’, and much admiration of woolly wonders that got handed out. Last Christmas we packed out the venue, pretended to knit briefly before casting it aside in favour of merriment, and exchanged lots of fabulous handknitted loveliness in mystery gift form (some finished at the very last minute). There is no limit to secret santa subjects. We’ve had gorgeous gloves, dinosaur stockings (stockings with dinosaurs on, not a sock of dinosaurs! ), pots of peeping posies, silky scarves, adorable armwarmers, and even a special Santa. Your present should cost approximately of £5. Your present can be ANYTHING, as long as it’s knitted or crocheted or at least handmade. You must make your present before the S&B London Christmas Party (in December, date and venue to be confirmed). Turn up at the S&B London Christmas Party with some Christmas cheer and your present wrapped up. Place your Secret Santa present in the magic sack. At present-giving time pick a gift from the magic sack. Open your present and squeak with excitement. Eat (cake), drink (insert booze of choice here) and be merry. What do you mean “Christmas already! It’s only October”? We’re giving you a couple of months of stitching time which will just fly by! If you need ideas to get you started, there are plenty of ideas from the last few years in our flickr group or our 2007 Party set. Remember, your gift is completely anonymous (unless you start pointing and saying “I made that!”) and it doesn’t have to be anything complicated – all gifts are valued equally. There’s only 64 knitting days till Christmas! Arrrrrrrggggggggghhhhhhhh! 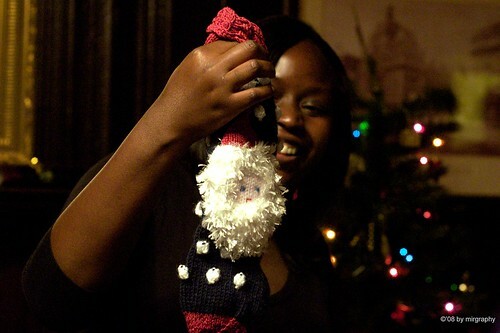 This entry was posted on October 23, 2009 at 4:37 pm	and is filed under Help Us Knit, Knit, Secret Santa, Stitch London. Tagged: Christmas, gift, Knit, present, santa, secret. You can follow any responses to this entry through the RSS 2.0 feed. You can leave a response, or trackback from your own site.